In a bowl you put the macerated strawberries with lemon juice and sugar. With the ingredients of the dough, you do a mass, which is not you stick to your hands, and during kneading will be caught belt, you leave two hours in tightly covered with a damp cloth so that you can not form crust refrigerator. Estiráis the dough with a rolling pin, which will frotaréis with a little flour so that the dough does not stick. Forráis a pie pan to him you will have previously smeared with a little butter and floured, the meteis to medium / hot oven until crust is cooked, so they are not mass pinchais well with a fork lift bottom. 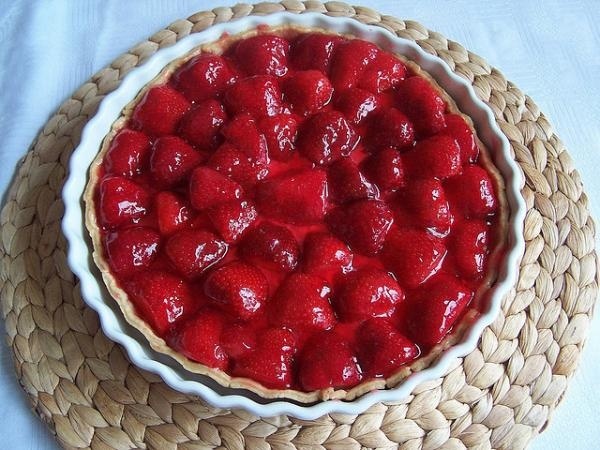 When the bottom of the pie this cold well, rellenáis with macerated strawberries and juice that have been released and a leaf or two, depends on the juice which have shed, fishtail (gelatin), gelatin is made, if It is to be used raspberry royal jelly, then follow manufacturer's instructions. Once dissolved gelatin in this pour the juice over the strawberries and allow to cool for two hours in the refrigerator so that the gelatin sets. Your imagination will dictate you do it with other fruit or combination of fruits. While enjoying this delicious strawberry pie.